After Unite's Applied Psychology Lobby of Parliament, we spoke to Dave Munday (Lead Professional Officer for Mental Health), to find out how the event had gone. So how was the Lobby? We were really pleased with a good show of support on the day and via Twitter and letters to MPs. We were calling on the Government to deliver their promises to increase mental health funding and reverse the continued cuts to mental health (as half of CCGs have cut funding to mental health trusts). We want to secure adequate ring-fenced funding for Psychology Services across the Country. We also want to protect highly skilled and professional psychological roles in the NHS and recognise their fundamental contribution to healthcare in the UK. We’ve also been concerned about attempts to downband, downgrade and deskill psychologists across the NHS. We want to see an end to the cutting of psychology posts. We are also asking HMRC to issue the due tax refund and rebates for psychologists and other professionals that underwent training via the widening access training scheme (WATS). Dr Nick Waggett, Chief Executive, Association of Child Psychotherapists. You can catch their speeches here and here. And we were really pleased to have Colenzo Jarrett-Thorpe, National Officer, Unite the Union and Antony Vassalos, Chair, Unite Applied Psychology Organising Professional Committee, organising this event for the Applied Psychologists. The dedication and energy on the day was amazing. The common themes were a passion for working together to provide the public with the high quality mental health services which they have a right to expect. Is the Five Year Forward View going to improve help for those with mental health problems? The Strategy to improve mental health provision is welcomed – but it is not ambitious enough, and it needs to be properly funded and staffed. Five years after Parity of Esteem was pledged, mental health care providers continue to receive far smaller budget increases than hospitals. A recent Kings Fund report showed a widening gap with budgets for MH trusts rising less than 2.5% in 2016/17, far less than the 6% increase received by acute trusts (between 2012/13 and last year MH got 5.5% and acute got 16.8%). The Royal College of Psychiatrists also produced a report last month based on their analysis that showed mental health trusts have been left with less funding than 2012 due to government cuts. “The total amount of income that mental health trusts in England received in 2016-17 was £11.829bn. While the figure has risen overall in each of the past two years, it remains £105m lower than in 2011-12 at today’s prices”. As regards staffing, in their workforce consultation Health Education England (HEE) highlight that “21,000 additional posts would be needed to deliver the specified [mental health] service improvements” and at the same time, ‘patients accessing mental health services’ are forecast to increase to 1.88 million by 2021 (fig. 12). So what comes after the Lobby? As a union, Unite are interested in the terms and working conditions of employees, but we are also a campaigning union, and we take pride in speaking up for better services for the public. ‘Registrants must: promote and protect the interests of service users [and] carers; and report concerns about safety’. 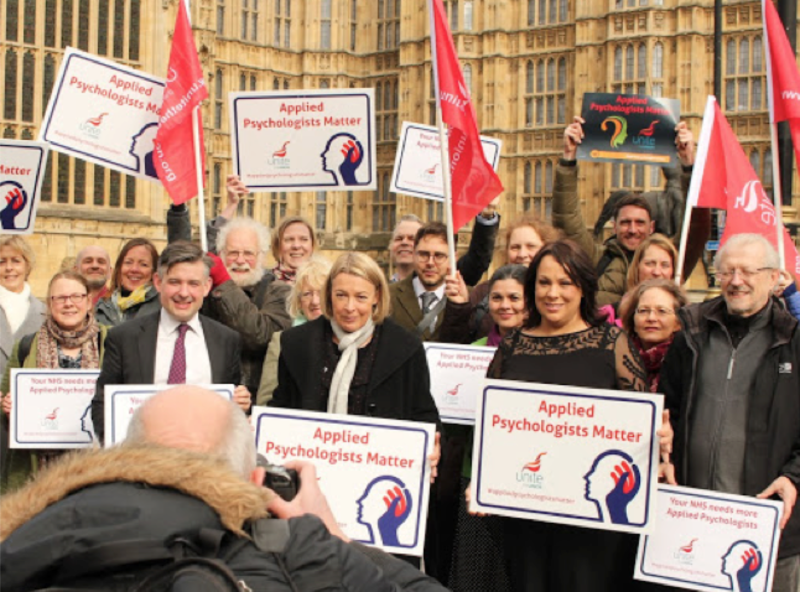 I hope that people will continue to contact their MPs to make the case for more applied psychologists. We need people who know the importance of these jobs to hold their MPs to account, explaining why current government policies are actually making their job harder, and not meeting the increasing demand for specialist psychology and talking therapies. There is evidence that the public want talking therapies, although few are offered them, as highlighted in the 2013 MIND report. With many mental health services under growing pressure, it seems unlikely that this picture has dramatically improved. We need an ambitious plan to expand psychological therapists – and across the range of need, including those with complex problems such as untreated trauma. Every letter, every question asked, does make a difference – improvements to ‘Breathing Space’ to include ‘#RecoverySpace’ were achieved by people lobbying for the amendments. We also have to take as many opportunities to raise concerns and campaign for better services. For example, recently through the consultation on the children and young people’s mental health green paper (Unite response is here) and the upcoming inquiry being carried out by the APPG for mental health. It is Mental Health Awareness week from 14-20th May and the focus is on stress awareness. Both Dr Natalie Kemp and Dr Amra Rao spoke passionately about the importance of good care for staff and preventing burnout. With clinical psychology posts having one of the worst vacancy rates in the NHS, it is clear that we need to treat staff right, so that they are able to help people who may have complex and challenging problems, which need long term and creative approaches to help them recover. If we look at their responses to last year’s NHS staff survey, for example, we see that 43.2% reported being unwell in the last 12 months. We need to fight for better mental health for everyone. After all, there is ‘no them and us’ – just us, together.